Nearest airport - Jammu (48 km from Katra) Daily Flights are available from Delhi, Srinagar, Mumbai and Other Major Towns. These flights (Indian Airlines, Go Air, Indigo, Jet Airways, Spicejet, Kingfisher) connect Chandigarh & Amritsar on some days of the week. Nearest Railway Station - Jammu By rail, Jammu is directly connected cities like Mumbai, Delhi Kolkatta and Chennai. Besides, it is connected with other major cities of the country. Jammu is the terminus of a large number of Inter State Bus Services. Buses leave for Katra every 10 minutes from the main bus stand at Jammu between 5.30 am to 8.30 pm. During rush periods, additional buses are also pressed into service between Jammu and Katra. Private Taxis are also available for hire between Jammu and Katra. These can be hired from Jammu Airport, Jammu Railway Station and the Tourist Reception Centre at Jammu. Yatri Niwas managed by the Shrine Board, Rest Houses maintained by the Jammu and Kashmir Tourism Department, other Hotels. Sarais, managed by the Shrine Board offer free accommodations at Adhkawari, Sanjichhat and Darbar. 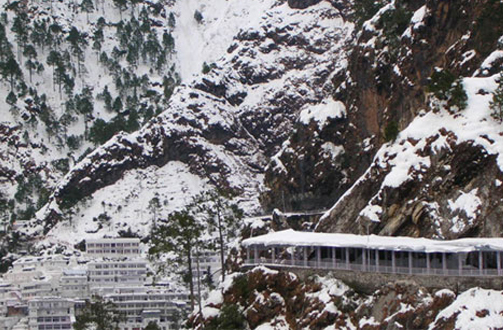 Dharamshala, run by various organizations offer reasonable accommodation to the pilgrims. Yatris are however advised to keep themselves away from touts promising free Dharamshala accommodations .